Thanks to a series of lasers across the course, the system tracks every shot that's hit, says Microsoft's Jason Campbell. While a lot of IT folk are concerned with getting five 9s for server reliability, the focus in the run up to the Microsoft Ignite event, taking place in Atlanta this week, was on the front and back nine. With the FedEx Cup finals of the PGA Tour Championship being played at the nearby East Lake Golf course, Microsoft, in partnership with the PGA, CDW's ShotLink and About Golf, has been showing off a solution set aimed at improving the viewing experience, and even helping amateur players improve their golf swing. "Thanks to a series of lasers across the course, the system is able to track every shot that's hit," says Jason Campbell, director, Windows commercial marketing. "The system captures over 70 data points, and with a 3D map of the course we're able to identify the position of each struck ball. There's a wifi mesh network across the entire course that is used to transmit the data back to our hub. Additionally, there's a member of staff who follows each player round to add extra data such as whether the shot went left or right, using Surface or Lumia devices. These data sets are then correlated to get a clear picture of the action." The ShotLink data is then made available, via Microsoft Azure, to the PGA Tour hospitality app, so spectators can access all the on-course action and assess the likelihood that a particular player will make a shot, based on historic data. 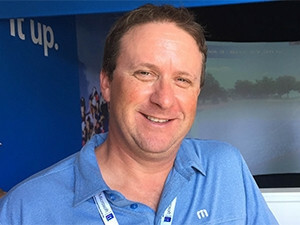 "This hospitality app is going to be the basis of a new Windows 10 consumer PGA tour app that will be rolled out later in the year to allow home-based TV viewers to get second screen data to enhance the viewing experience," says Campbell. Amateur players could practice their swing, hitting into a simulation screen powered by About Golf. 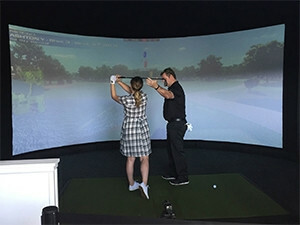 An extra tent at the course allowed amateur players to practice their swing, hitting into a simulation screen, powered by About Golf, with three cameras capturing the player's swing from above, behind and the side. After the initial swings the golfing coach, on hand, provides instruction and improvement to the technique. The system tracks the data and records it. The idea is that this data is then stored in the cloud and additional voice and annotations can be added, and pulled down by an app. "The player could then access that information on any device later, such as on a tee on the 15th hole when they're trying to remember what the instructor had told them before," says Campbell. While still in the early stages of development, such solutions can be developed at scale at golf courses, driving ranges and even the homes of wealthy amateurs. And if you can't afford the estimated $125,000 fee to set up the simulated, data-recording driving range, a couple of consumer companies are producing RFID and GPS chips to plug into the handle of the golf clubs.